What was once seen as a phase in the auto industry has now become a staple: We’re talking about the crossover. No longer the weird new kid in the corner of the showroom, the crossover has taken centre stage, pushing all other models out of the way. And there’s no denying that Honda’s HR-V helped this particular boom rise to the popularity it has today thanks to it’s Honda drivability and practicality. It’s not just that the Honda HR-V is riding on the wave of crossover popularity, this versatile vehicle is well made, well designed, and fun to drive. Fuel efficient and comfortable inside with lots of interior space for passengers and cargo, the 2018 Honda HR-V is a serious contender amongst all the crossovers currently on the market. 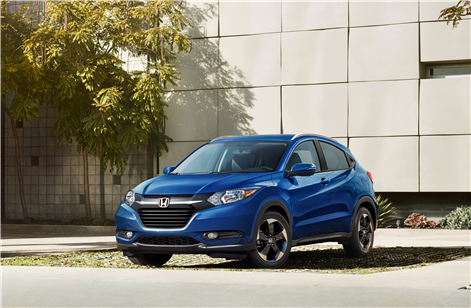 The 2018 Honda HR-V is equipped with a 1.8L i-VTEC 4-cylinder engine that produces 141 horsepower and 127 lb-ft of torque, across the lineup. Enter the lineup with the LX and you’ll get to row your own gears as standard, however, a CVT is available. For the EX or EX-L NAVI models, the CVT is standard and the only option. Honda’s Real Time AWD is offered across the line, but FWD is only standard on the LX and EX, and not an option on the top-level EX-L NAVI. Now in a segment as rife with fuel-efficient vehicles as this, the 2018 Honda HR-V offers up some stellar numbers for a compact crossover: The base LX with a CVT and FWD sees fuel consumption as low as 8.3L/100km in the city, and 6.9L/100km on the highway. The highest trim EX-L NAVI with CVT and AWD will see 8.9L/100km and 7.5L/100km. The 2018 Honda HR-V offers a sizable 688 litres (657L in the AWD model) of cargo space behind the rear seats, and that space increases to 1,665L (1,583L for the AWD EX and EX-LNAVI) when those seats are dropped. You’ll recognize the interior design immediately as being typically Honda, in all the right ways. Sitting inside the 2018 Honda HR-V is a good place to be with an entertainment system that features Siri Eyes Free compatibility, SMS text message function, as well as an available XM satellite radio, and two USB ports. To find out more about the 2018 Honda HR-V, head down to your local Halton Street Honda to speak to one of our experts. And don’t forget to book a test drive, too.